Someone told me a while ago that there are two types of weavers – those who are drawn to the color/texture/fibre and those who are intrigued by the process. I know, absolutely, that while I love the process, it’s the color and texture that speak to me. It all comes out of that. If I could eat these colors, savour them like wine, or crack them between my teeth like a delicious hard candy, I would. They’re like flowers, a profusion of color and unintentional pairings that make new colors. Like anyone who works with fibre, I have a lot of it. 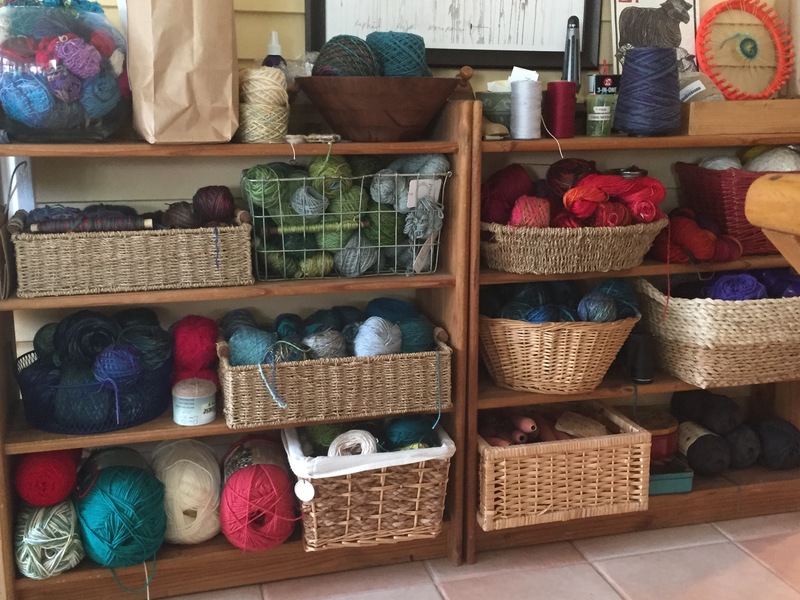 There are jokes amongst weavers and knitters about their “stash” (it’s a nice way of saying “hoard”). I go through phases where certain colors appeal to me, or textures. I usually buy fibre with no particular project in mind. The color appeals, or it feels good. Sometimes it smells good (silk). Sometimes I buy it because it’s on sale, or as a souvenir of a place I’ve visited. Sometimes I buy it for a specific commission, but I almost always have trouble with that…. 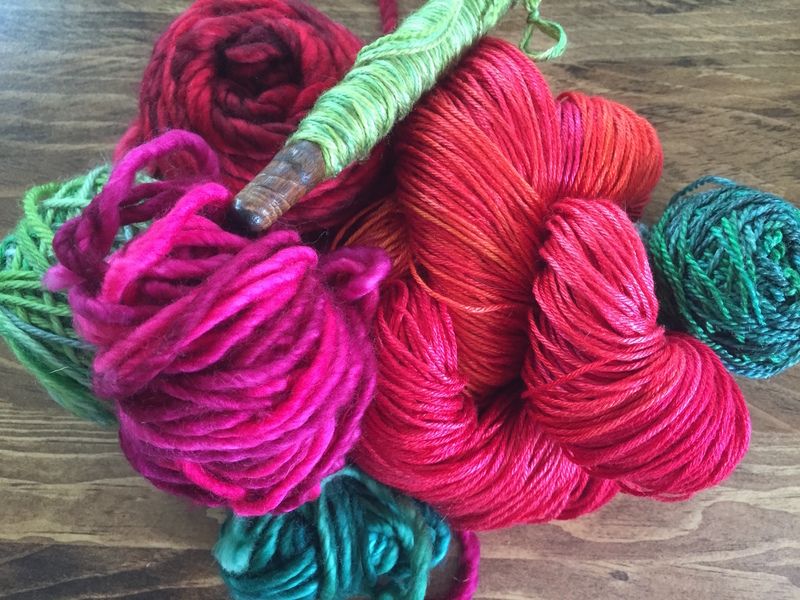 I’ve found that projects almost always come out of the color/fibre I have, not the other way around. When I try to reverse-engineer it and say, produce a “blue blanket” for someone, I will have a bit of Weaver’s Block until I find a blue that works for me. There’s a mysterious alchemy; a serendipitous confluence of color/emotion/meaning that happens eventually. It might sound weird, but as I continue to explore how ideas happen I find myself more often than not using language like that. It is a beautiful Mystery, creation. I bought this a while ago, with – as usual – no real purpose in mind. 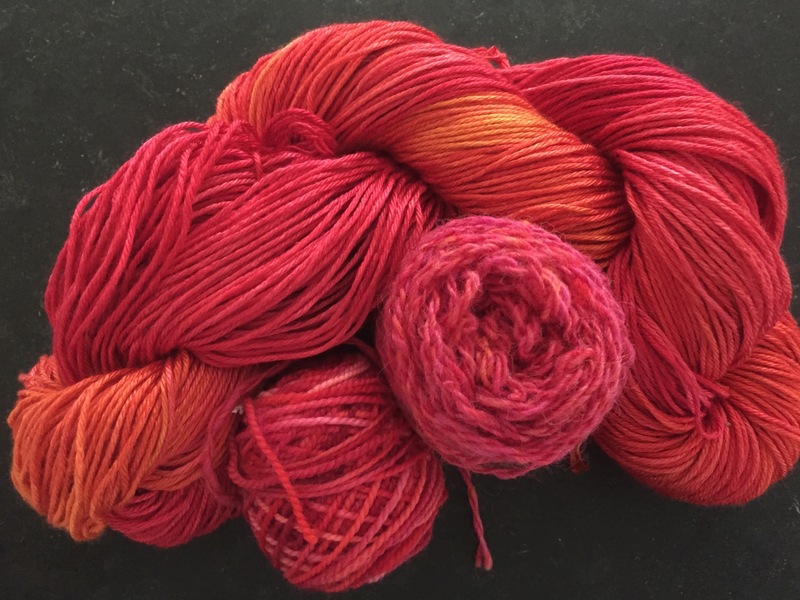 It’s from Mineville Wool Project; I’ve written before about how much I love them and their beautiful one-off unlabelled fibres (the two little balls are some local homespun I bought at the North Mountain Farmer’s Market, and some koigu sock yarn). I often think of my internal palette/palate as being predominantly green-blue-yellow, but this red-orange-pink keeps popping up. Then I forgot about it. I haven’t even wound it into a ball yet. I’ve been concentrating on a project with purples and greens (oh! 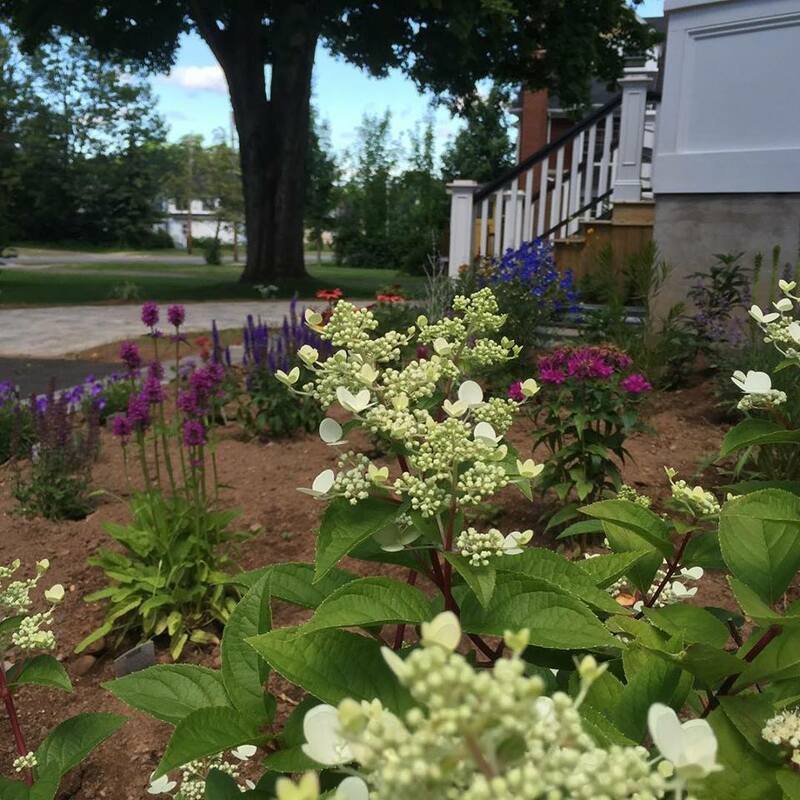 purple and green, how I love them), and then I left my loom for a bit – got involved in planning and filling the new front garden, and had a little anniversary trip with my husband to the adorable funky town of Parrsboro. 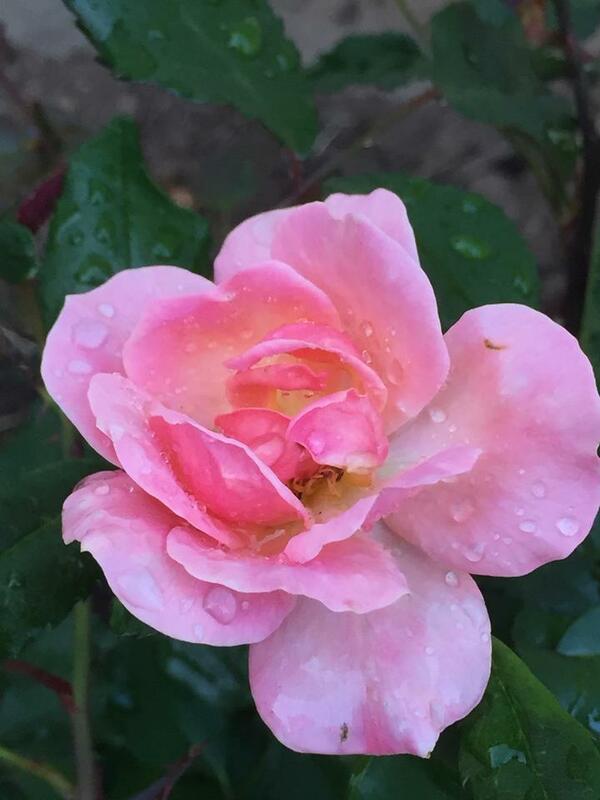 They had some gorgeous roses in the Inn’s garden, and I reminded myself to look them up when I got home. If you have time, you should visit that town – you will be seduced. Mine bloomed shortly thereafter and this came up – that silky hard-to-pin down coral pink/orange combo. Just to die for, no? I cannot seem to get enough of this color combination all of a sudden. The corals and pink and orange. The softness of a pink that’s somehow so much more when you add the acid warmth of orange to it. The brashness of orange, tempered with the pinks. The surprising shades in between… it’s lovely. 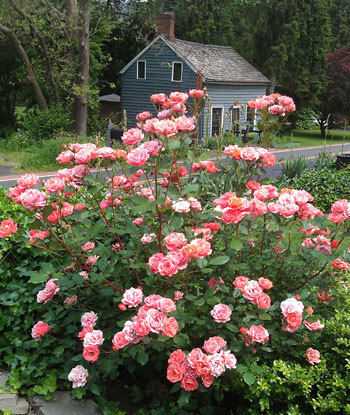 Once I remembered to look up those gorgeous flowers that I saw at our Inn I found that they were Charles de Mills roses. 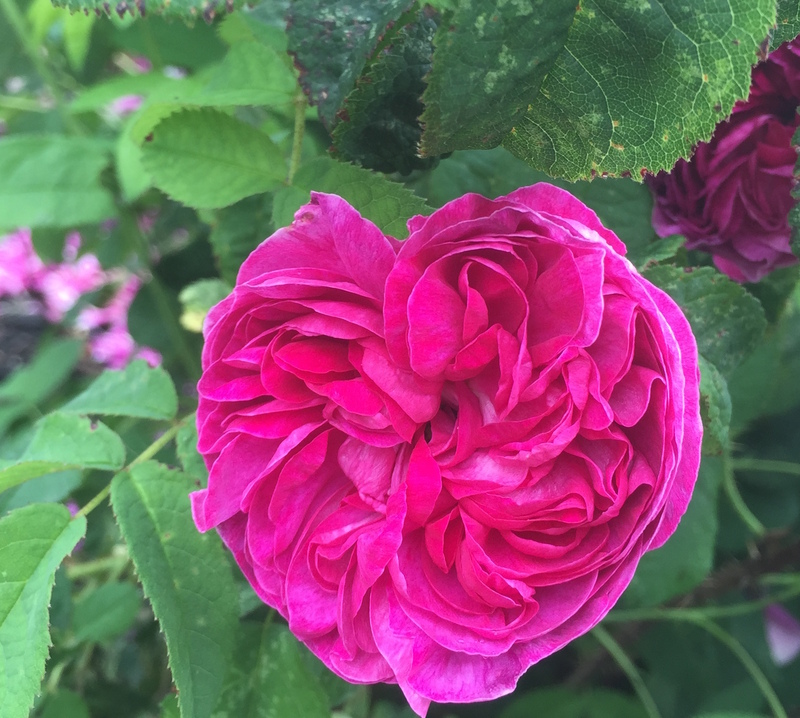 A Gallica rose – lush, potent, crimson/burgundy and hot. They date back to the 1790’s; I cannot resist those old double blooms. In my search for Charles de Mills, I was side-tracked by this other beautiful specimen: the Anne Dakin rose. Who can resist that? They are on my wish list, along with the Alchymist rose. It’s the changeable colors, I think – that hot burgundy crimson that feathers out to pink; the peachy coral orange yellow pink that can’t be captured entirely. Cézanne also said “I was very pleased with myself when I discovered that sunlight could not be reproduced; it had to be represented by something else… …by colour.” Maybe that’s what I’m working with here; it’s also the memory of the day I smelled the rose, the way the sun came out later that afternoon, the way I held my husband’s hand as we walked by the garden bed. Again, a beautiful Mystery. This is a lovely story, my friend. 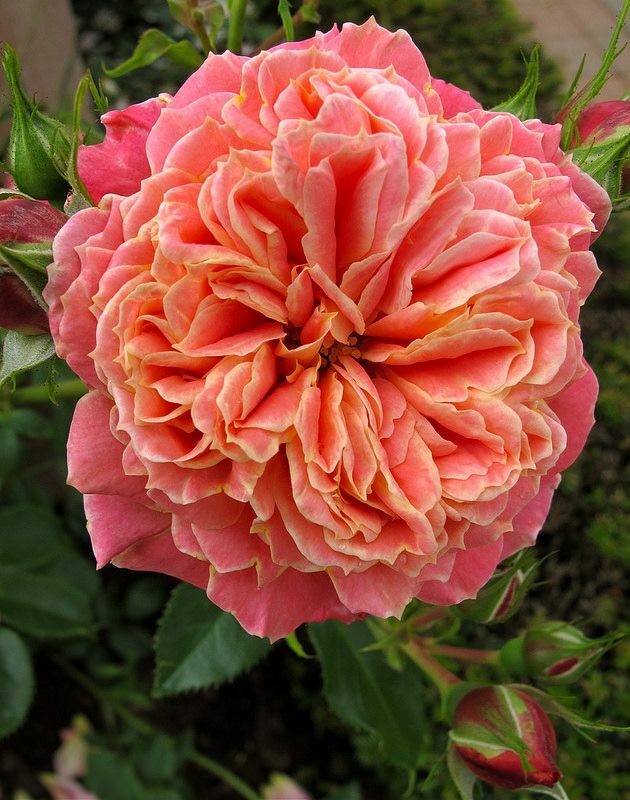 I will try to help with acquiring both Charles de Mills and Alchymist roses for you. I happen to know some people who are quite handy with propagating, although roses can be tricky. It’s no rush… there’s always a place for a new rose, and I don’t need it this second. In the meantime, I’ll weave my roses.